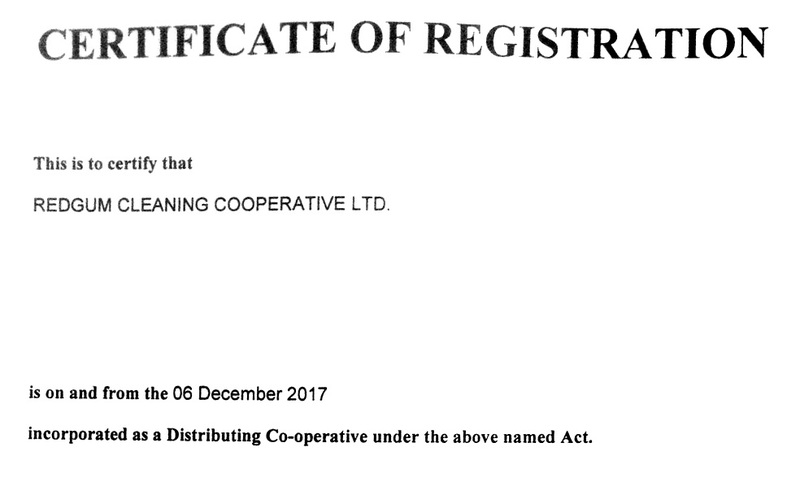 The Redgum Cleaning Co-operative is celebrating after holding our official formation meeting on the 22nd of November, and having our formation approved by the Co-operatives Registrar! After ticking a few more bureaucratic boxes, our worker-owned business is set to launch in early 2018. If you’re interested in being among our first cleaning clients when we kick off, please get in touch at redgum.coop (at) gmail.com. For those catching up – Redgum is a worker-coop that will provide green cleaning services to homes and offices around Melbourne, and along with the factory in Morwell, will be one of the first co-operative enterprises in the Earthworker network. At our formation meeting we elected five member representatives to our board, as well as two non-member representatives, who will add the benefit of a fresh perspective as people outside our daily operations. These were Sean Bezard, an Earthworker organiser who will facilitate communication and collaboration between Redgum and the wider Earthworker network, and Kirsten Young, a corporate lawyer with an interest in supporting democratic and equitable ways of doing business. The following weekend, we met again and mapped out our vision and goals for 2018. Next year, we will aim to take on 40 – 50 cleaning clients in order to fill the current needs for work within our membership. In addition to our business aims, we discussed how we will foster a democratic, respectful and empowering culture within the co-operative, and use this project as a tool to promote worker-ownership in the cleaning industry at large. To that end, we mapped out a plan to rotate key roles within the group (such as administration and customer service), so knowledge and skills are shared. We also set the goal of developing an induction curriculum, so new members can understand the values of the co-op and how we work. We hope to be in a position to recruit new members toward the end of 2018. Thanks for reading, and we wish all of our comrades a safe and happy holiday season, and look forward to updating you on our progress next year!